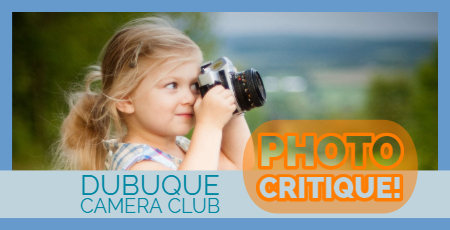 The Dubuque Camera Club will meet on Monday, May 20, 2019 at 6:30 p.m.
Club members can submit 1 to 3 photos for constructive feedback. CLICK HERE for the Critique Guidelines. Email your images to Ken, with Photo Critique as the message subject. They can be Reflections submissions but don’t have to be. It’s OK to send Photoshopped images. Subject matter and dimensions/file size is open (No need to follow N4C rules). Note: May 20 will be our last regular club meeting of the 2018/19 N4C season. June 3rd will be our annual potluck picnic. We do plan to meet informally this summer. The N4C season will start up again in September.